Vijayanagar Beach is an exceptionally beautiful beach located in the beauty-famed island of Havelock. 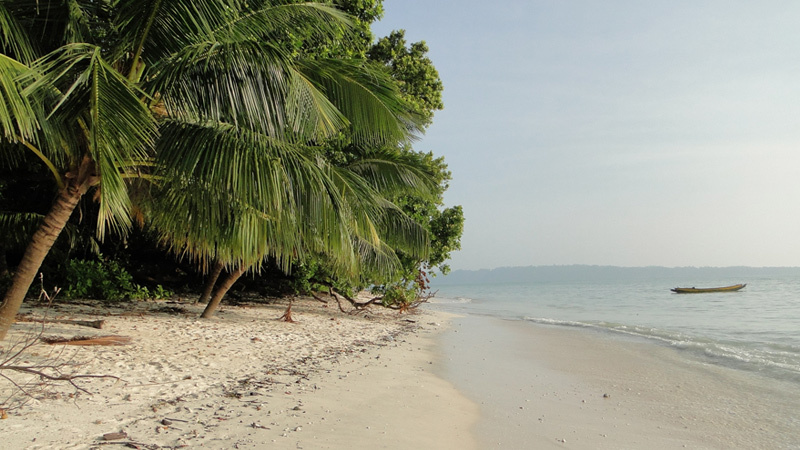 Havelock is among the must-visit places of Andaman tourism. Vijayanagar Beach is also known as Beach Number 5 and can be accessed from Port Blair via boats, ferries and cruises. This beach is just 38 kilometres from Port Blair. Vijayanagar Beach is a popular haunt for water sports enthusiasts. It is a perfect destination for going for a refreshing swim in the warm clear waters. The beach unfolds the exquisite beauty of the blue seas meeting the blue skies. It has the peace and solitude required to sooth tired minds. Like all other beaches of this beautiful island destination, Vijayanagar Beach also provides ample scope of relaxation and enjoyment. The intense solitude makes this beach ideal for travellers in search of privacy and peace. The stretched coastline is lined with an army of coconut palms. A visit to the serene beach gives a sense of freedom and solitude and some exclusive memories that remain etched lifelong. The several restaurants lining the beach offer mouth-watering delicacies, continental, sea-food special and South Indian varieties. Spend some quality time in this beach. It is worth the experience. The beach is never rocky like some of the other beaches and one can enjoy the loose warn sands to heart’s content. Vijayanagar Beach offers a beautiful sunrise point. It is a sheer pleasure to watch the golden sun rising above the blue seas gradually spreading its golden sheen into the waters. You watch the sea colour change from dark to warm liquid blue as the sun’s rays light it up. It offers some excellent scope of nature photography of the seas and the sun. No Havelock experience would be complete without a visit to the exquisite Vijayanagar Beach. This beach gives a chance to escape the maddening crowd and attracts peace-loving people in search of solitude. The splendid white sands along with the turquoise blue waters tempt you to dig into the sands for a lazy day with a drink and a book. Catch on with your nap or your swim in the calm seas. This beach is known for some very good hotels such as the Silver Sand Resort or the beautiful government-run Dolphin Yatri Niwas. The beach is an attractive spot for delightful beach activities such as snorkelling, scuba-diving and fishing. A long walk along the beach during dusk or dawn can be an unforgettable experience.